The Cleaning Station is your ultimate ergonomic organizer. This sleekly designed free-standing system fits and enhances any decor.A user-friendly process: PULL, SPRAY, WIPE, TOSS, CLEAN HANDS promotes good hygiene habits, a healthy environment, and all around germ protection. 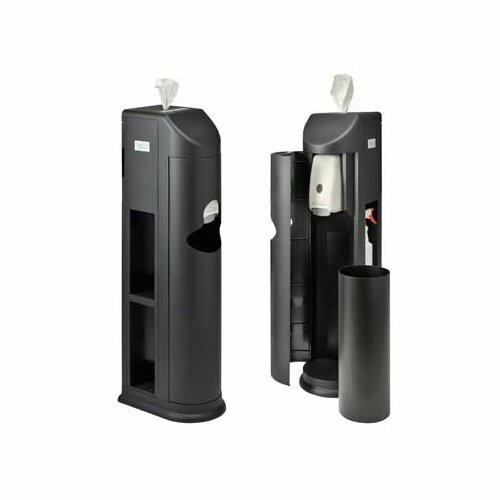 Features: Wet or Dry Towels - Unique nozzle exchange system allows for either; Surface - Durable, textured and won't scratch, dent or rust; Hand Sanitizer - Changeable dispenser allows for a variety of sanitizers; Trash Receptacle - Hidden from view, but easily accessible; Shelves - 4 shelves to hold spray bottles, tissue boxes, gloves, masks and more. Dimensions : 47" x 17" x 12"